Proudly Serving Auburn, Roseville & Grass Valley and the Surrounding Areas. At Moule's Foothill Glass, our retail section has a full line of hard to find parts for windows, doors and specialty glass, including a full assortment of rollers for wardrobe doors. We also carry manufacturer recommended glass, shower door and mirror cleaners, including the highly popular A-Maz & Sprayway glass cleaner. From simple single pane windows to dual pane replacements. We specialize in replacing your failed double pane windows. We install shower and tub enclosures as well as frameless glass doors. Top off a new bathroom look with a beautiful beveled mirror, with hardware to match your existing. 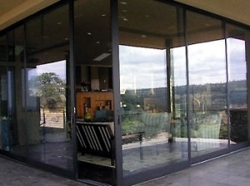 We also carry and install mirror wardrobe doors and specialize in custom glass for tabletops and bathroom windows. Finish the outside look with new screens or re-screen your old with sunscreen and/or pet screen to safeguard against harmful UV rays. From simple repairs to a complete storefront for new construction, we have most pivots, safety glass and closures in stock.